This post is about Working with gRPC in ASP.NET Core. gRPC is a language agnostic, high-performance Remote Procedure Call (RPC) framework. Modern high-performance lightweight RPC framework. Contract-first API development, using Protocol Buffers by default, allowing for language agnostic implementations. Tooling available for many languages to generate strongly-typed servers and clients. Supports client, server, and bi-directional streaming calls. Reduced network usage with Protobuf binary serialization. 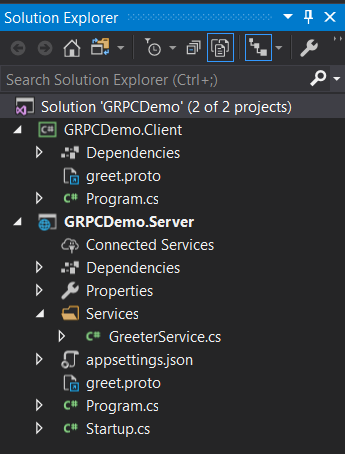 If you’re using Visual Studio 2019, you will get gRPC project templates to build services with gRPC. 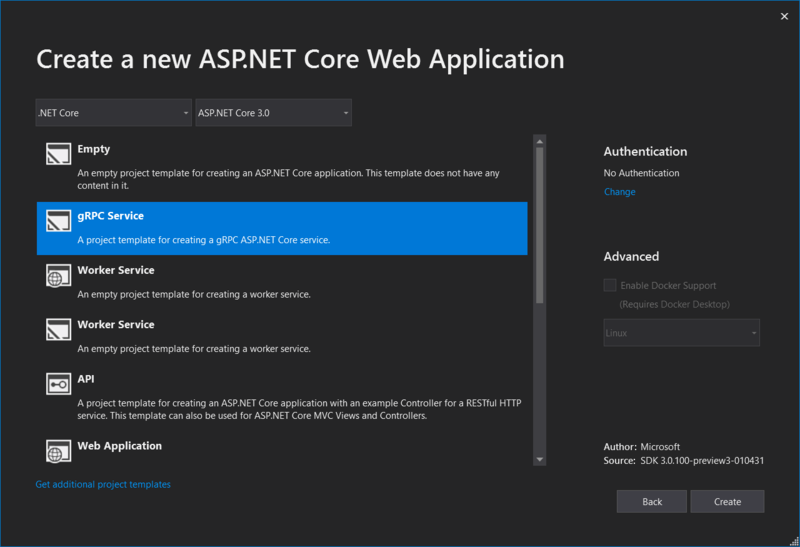 gRPC templates will only available in .NET Core 3.0 projects. Once you create a gRPC app, you will get two projects - one server project and one client project. In the server project, the proto files defines the services. protobuf aka Protocol Buffers is a method of serializing structured data. It is developed by Google. Here is the default Greet service which comes as part of the template. This definition is simple and straight forward. You’re creating a package, and a service with one SayHello method. This method accepts one parameter HelloRequest and returns a response object HelloReply. That data structures as well included in the method. You can generate code from proto files - if you’re using Visual Studio, when you build the project, it will generate the code for you. It will generate Greeter.GreeterBase and you need to write the implementation by inheriting from this class. So here is the implementation of GreeterService class. The ServerCallContextparameter helps you to access HTTP/2 message data. You won’t get the HttpContext from this parameter, there is one extension method available GetHttpContext() which helps you to access the HttpContext object. In the server project, you can find reference of Grpc.AspNetCore.Server package and Google.Protobuf package. You will be able to find reference of Grpc.Tools package reference, which is used to generate code from proto files. In the client project similar to server you will be able to find reference of Grpc.Core package and Google.Protobuf package. And the Grpc.Tools as well. The proto files are added in a Protos folder in the root level. Visual Studio will display it is a shortcut in both server and client projects. In the startup.cs file, you need to add the Grpc middleware in the ConfigureServices() method and you need to map the implemented services in the Configure() method. And in the client project, you can create an instance of GreeterClient class and invoke the SayHello method, like this. This post was a very basic introduction to gRPC in ASP.NET Core. Here are some helpful resources about gRPC on .NET and C#.